Lake Bolac is a rural township on the junction of the Glenelg Highway and the Ararat-Mortlake Road, 75 km east of Hamilton. The lake is the largest of several in the district, and its name was given to a pastoral run in 1844. It is thought that Bolac is derived from an Aboriginal word meaning frogs. The township has Lake Bolac on its east and Salt Lakes on its west. When surveyed the township was named Parupa, but local usage caused the name change by the 1870s. A shanty was built near Lake Bolac in 1856, six years before township blocks were sold. Their sale coincided with the construction of a bluestone hotel, part of which has continued in use. A bluestone general store, Veale’s, was built in 1868. Within a decade or so there was a school (1866), a Catholic church (1872) and a Presbyterian church (1878). After World War I a memorial hall was opened and a bush nursing centre was established. During World War II flax was grown at Lake Bolac, and processed by Land Army women. A flax mill was built, and after the war displaced persons from Europe worked there. Further soldier-settler farms were settled in the 1950s. The lake is fresh water, and it has been drawn on for irrigating potato and lucerne crops. 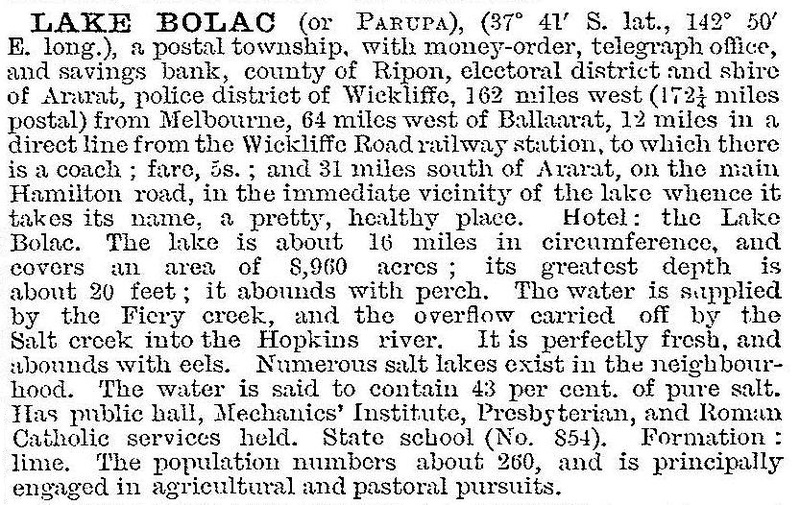 A peak in Lake Bolac’s population occurred during the 1954 and 1961 censuses. A high school began in the Presbyterian church hall in 1957 and by 1960 the purpose-built school had over 150 students. A new bush nursing centre was opened in 1957. An Anglican church and a new Catholic church were opened in 1958 and 1961. Between 1975 and 1994 a sports complex was developed beside the lake including a swimming pool, ovals, tennis and netball courts. A golf course, yacht club and boat ramp are nearby. Lake Bolac college had 81 pupils in 2014. In 2013 hundreds of brolgas were seen to return to Lake Bolac following the drought. A new sewerage system opened in 2013 used a natural filtration system to create a wetland habitat for native plants and animals. The Lake Bolac Eel Festival is an annual event. The P-12 college had 96 pupils in 2010.